n J!Extensions Store it's an easy few steps process to see and get products, you can do so with a few simple clicks and just completed order you can immediatly download the products on their own. Moreover you will gain active support for extensions and 1 year FREE updates for new releases of products from date of purchase. All products have NO DOMAINS RESTRICTIONS. Our extensions store is based on an automated ecommerce system and payments checkout for paid products, user's data are processed by Paypal or 2Checkout HTTPS servers for maximum security and payment flexibility. In this way you can pay with your preferred method, with your Paypal account or your preferred credit card. NOTE: for FREE products the payment steps will be entirely skipped. Be careful to not download our products on websites other than this one, our extensions can be downloaded only on this official website. If you find our extensions downloadable on other sites at a cheapest price or for free, be sure that viruses, malwares, security injections, malfuctioning and hidden links have been added by other people in our products to infect your PC or Joomla! website, thus download and install those extensions on your site at your own risk! Moreover it is logical that we can't provide support for our products downloaded elsewhere and without a valid purchase license, obviously those are pirate sites that distribute illegally our paid software and if we discover that you install and use it on your website you could be sued according to the law. 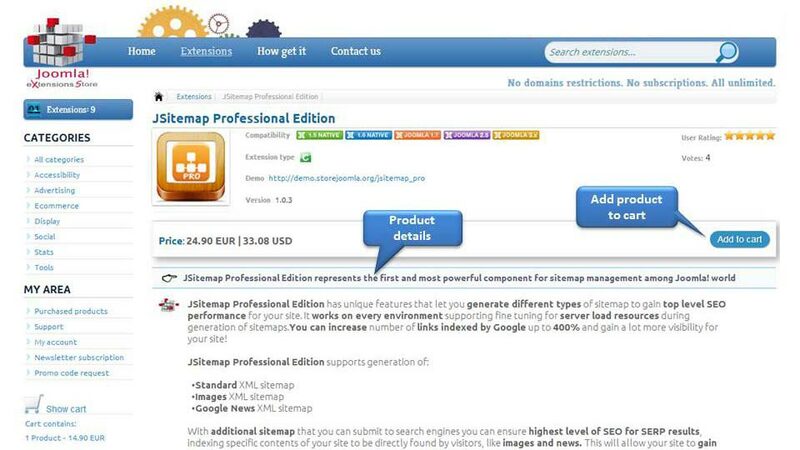 You can see our products in home page slider or semantic lists as "Most popular", "Featured", "High rated". Otherwise by clicking the menu voice "Extensions" you can see "Featured extensions" tabs and you can perform an advanced search using form filters or a quick search by category type. If you perform a search you can choose product from resulting list for particular keys, you can list also all products or purchased products. You will see a short description and by clicking on "View product" you will be redirected to the product sheet. For all products you will be redirected to a data sheet with product details where you can view description and product main features. 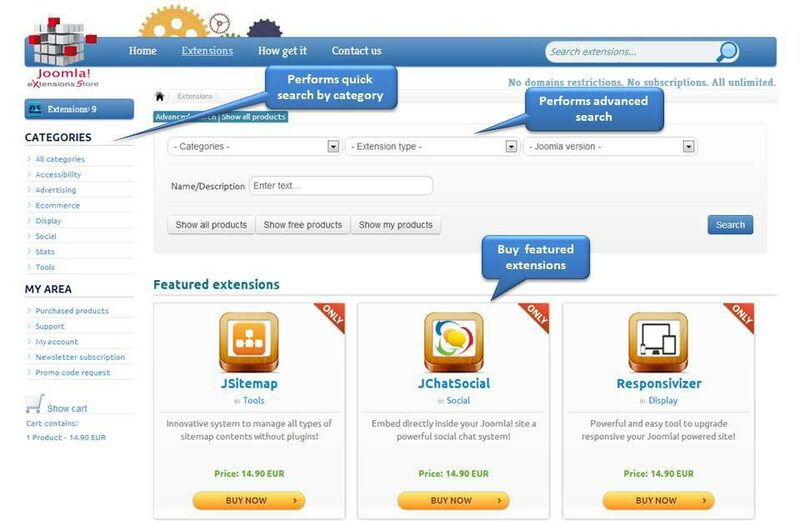 The data sheet also provide information like Joomla! compatibility, type of extensions included into the product, current version number and, if available, a demo link to try the extension. 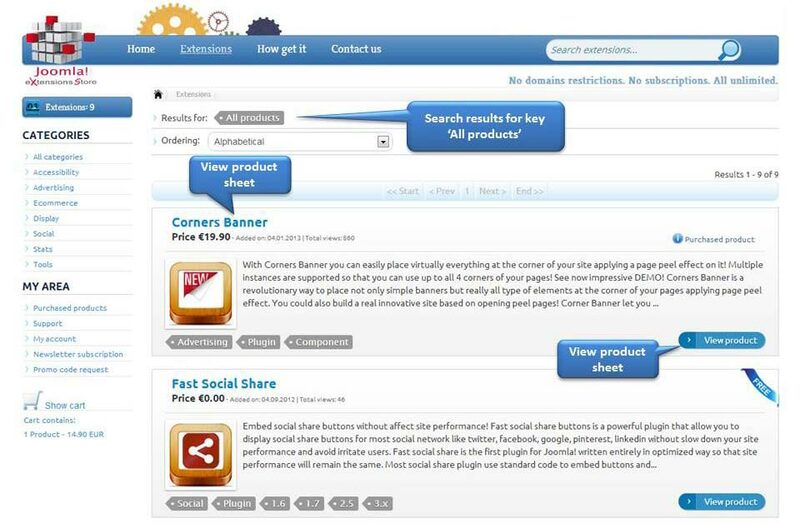 Moreover you will find the product screenshots to see how it works and appears, and finally you can rate the product and add it to your cart by clicking on the provided button. 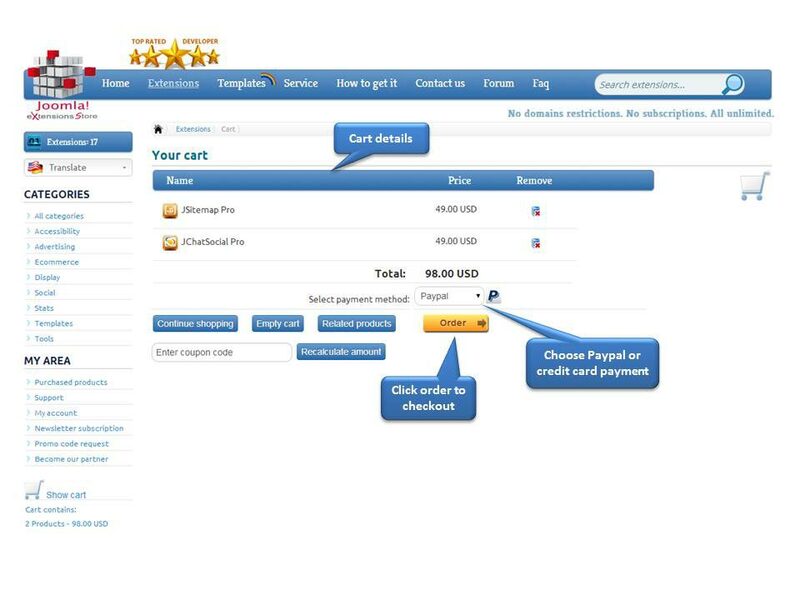 Everytime you add a product you want to purchase to your cart, you will be redirected to your cart details page, where you can see the subtotal and total amount of your order, and proceed with the order checkout simply clicking on the "Order" button. When clicking on the "Order" button your order will be registered in our system and you will receive a first email for the 'Order Placed'. As soon as you click "Order" button you will be redirected in a few seconds to the secure HTTPS server hosted by Paypal or 2Checkout to complete the payment, depending on the payment method you chosen. 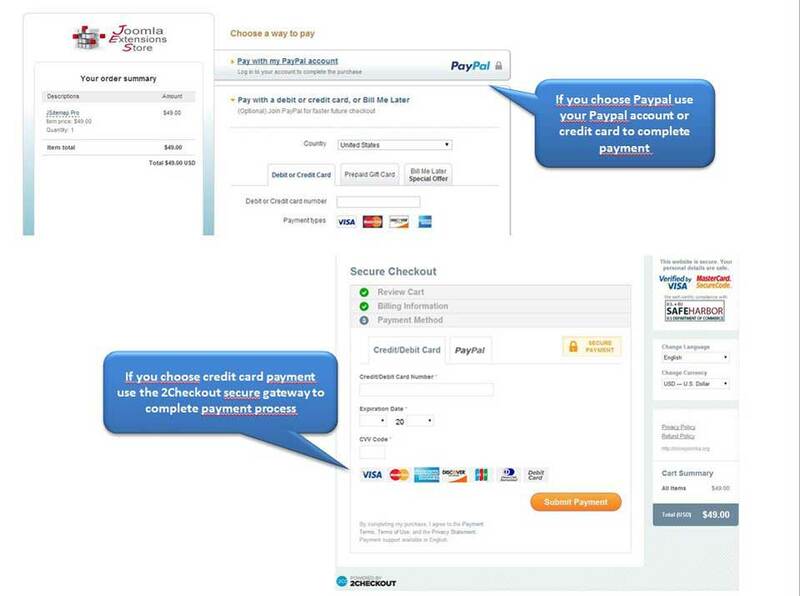 You can use your Paypal account or your preferred credit card for money transaction. Once completed the transaction using either Paypal or 2Checkout gateway, you will be automatically redirected to our store, in your reserved area, where you can download immediately products purchased. You will be automatically redirected to our store after payment completion. If something goes wrong after payment, you can manually return to our store and simply click on "Purchased products" visible in "My area" left menu. You will gain access to a file-system structure where you'll find folders for products you paid for. You will receive additional emails for the "Order completed confirmation" from our system and from the payment gateway you chosen including the transaction details. Normally you must receive a total of 4 or 5 emails for the whole process. In any case your payment was succesful but products access is not active, contact us by email providing informations for your account. Click on the folders to see its contents, and you will be able to download the files.